Elegant, inspiring cutlery will look superb in any home and bring charm to your dinnerware, adding a sparkling touch to the table. 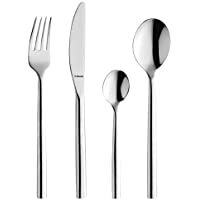 Dine in style with our quality range of cutlery sets and canteens. Featuring a variety of contemporary and classic designs, including sets from Arthur Price, you’ll find beautiful knives, forks and spoons which perfectly complement your table setting.